The latest additions to the ever growing list of my “to reads”. This group runs the gamut from a San Francisco crime novel to a reverse love story set in Paris and London. Frog Music/ Emma Donoghue/ A gripping and dark crime novel set in San Francisco in 1876. Told in episodic flashbacks, this is an investigation into the real-life, unsolved murder of Jenny Bonnet during one sweltering summer in a city beset by swindlers, millionaires, bohemians, and the small pox epidemic. The Invention of Wings /Sue Monk Kidd/ Set in the early nineteenth century in Charleston, the novel follows two young women (one born into privilege and the other born into slavery) who refuse to take the paved road and instead pave their own ways. Kidd wrote The Secret Life of Bees, one of my all time favorite reads. I Am Having So Much Fun Here Without You/Courtney Maum/This is an unusual love story packed with wit and emotional bite. The enchanting European setting is an added bonus. Buy it now. The Imperfectionists/Tom Rachmen/This debut novel the topsy-turvy private lives of the reporters, editors, and executives of an international English language newspaper as they struggle to keep it—and themselves—afloat. **Set in Rome, what could be better! The UnAmericans /Molly Antopol/The short story collection about political dissidents and actors imprisoned during the Red Scare, and others feeling disillusioned with their country. Historical. Always enticing. I’ll Be Right There/ Shin Kyung-sook/Set in 1980s South Korea amid the tremors of political revolution, Jung Yoon, a highly literate, twenty-something woman recounts her tragic personal history as well as those of her three intimate college friends. 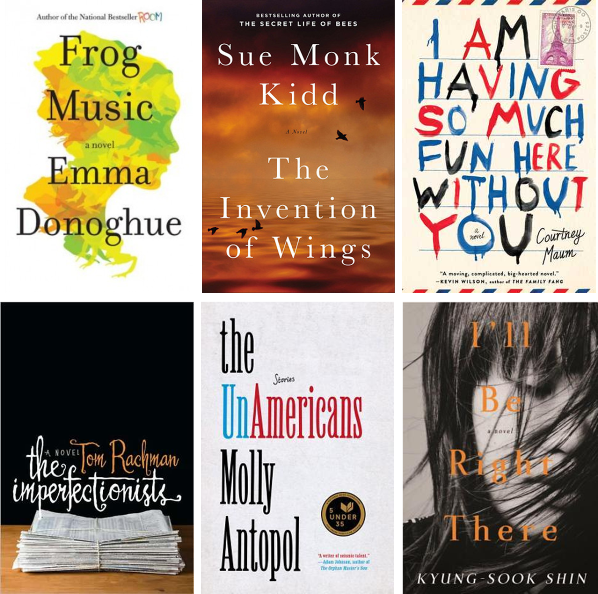 This entry was posted in books and tagged Frog Music, I am Having So Much Fun Here Without You, I'll Be Right There, reading, Spring, The Imperfectionists, The Invention of Wings, The UnAmericans. Bookmark the permalink.